So it was like this. The lighthouse was tiny and we had to split into two groups to go up the tower. Linda, Mary Alice and I were in the first group. When we came down and re-entered the gift shop, we decided we’d horned in long enough. We thanked the rangers for allowing us to join the tour and walked outside. 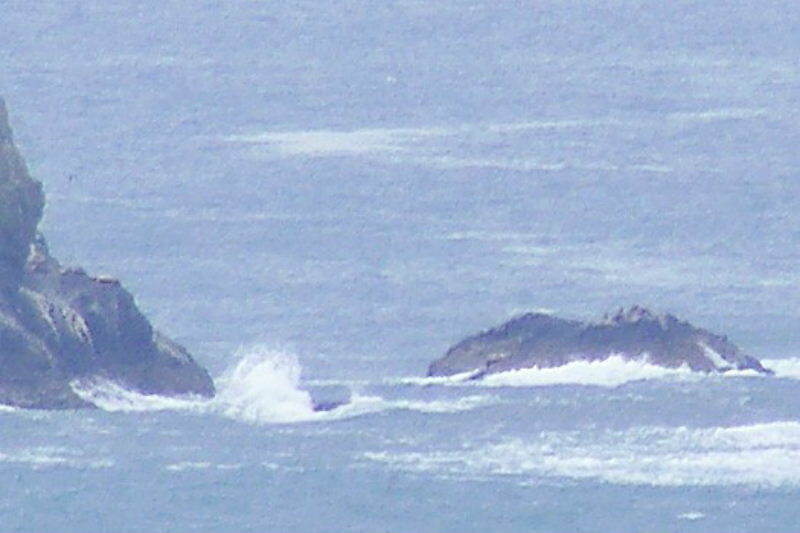 Just south of Cape Meares, several rocks jut out of the ocean. 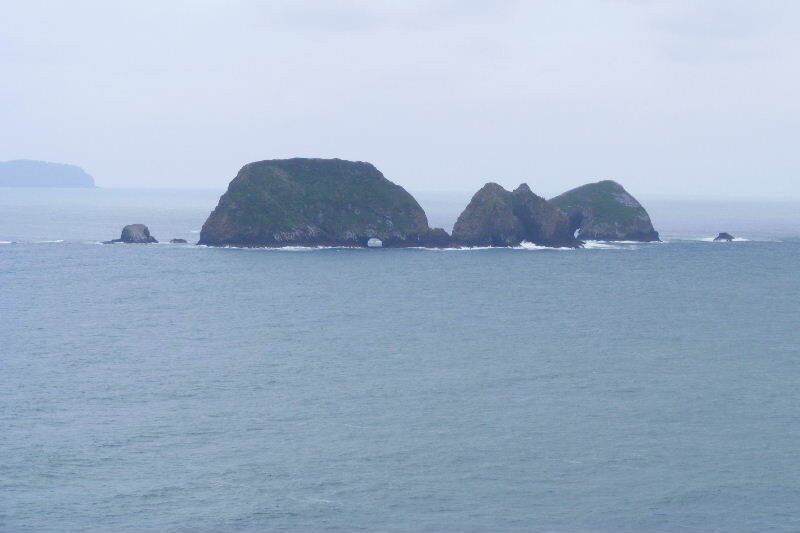 Three of them have arches in them, and so are cleverly called Three Arch Rocks. I stopped on the path that runs along the top of the cliff and scoped the area, still hoping (but not expecting) to see sea lions. But I did see them. 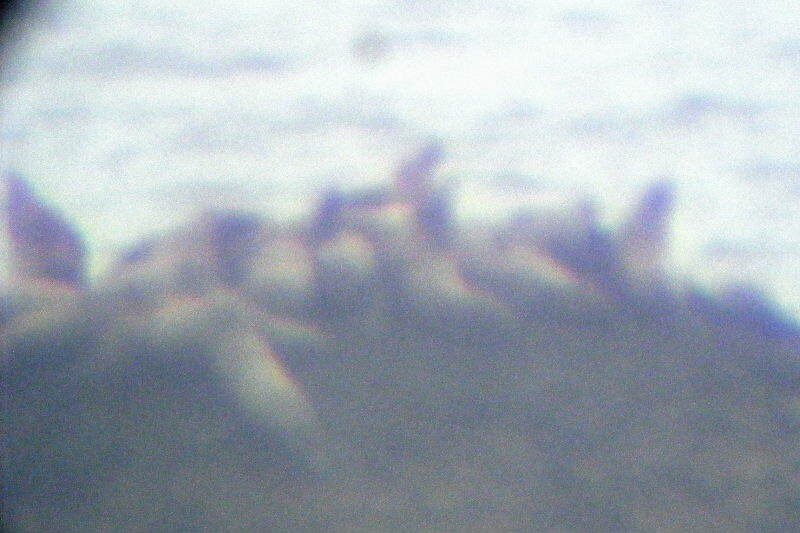 On a low rock to the left of the three large ones, eight or ten sea lions were moving about. They were about a mile away, but through my spotting scope, I could get a pretty good look. I saw several more arrive and climb up onto the rock. I saw two, presumably young males, fighting and, on another larger rock to the left, I could see the head of a large male. When the group came out of the lighthouse, I let them all look through my scope. The ranger who had told us we couldn’t see them there took a look and misidentified them as California Sea Lions (which couldn’t be because only male California Sea Lions make it north to the Oregon Coast and there were many females in the group I was looking at). Here’s a bit of the above photograph zoomed to a ridiculous extreme. Not very satisfactory, but it beats not seeing them at all. I was very glad I’d brought my scope. I debated with myself before the trip. I didn’t want to lose it or break it, and it is heavy. In fact, on the plane ride out, my luggage was over the 50-pound limit and I had to take several books out of my checked back and add them to my already heavy carry-on bag. But it was worth it.